This boutique hotel will introduce you to the charm of Lao culture and tradition, located in the heart of Lao "Vientiane" Capital, near the riverfront and 4.7 km from Wattay International Airport. The hotel offers a variety of room types with 26 rooms to choose from with beautiful wooden furniture, TV, free wireless internet access, an iPod docking station, a seating area, and stylish bathrooms. Most rooms have a private balcony where guests can enjoy the beautiful scenery of the Mekong River and the city of Vientiane. Popular attractions in the area include the Khop Chai Deu, Joma Bakery Cafe, the Khop Chai Deu Restaurant, and National Cultural Hall. 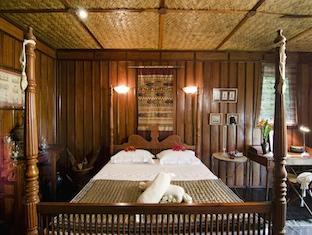 Dhavara Boutique Hotel will surely give you the comfort of your home in the traditional Laos style. Dhavara Boutique Hotel in Vientiane! 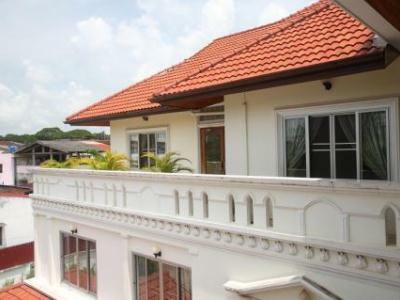 This charming property resides on a quiet lane right in the center of the historical capital of Vientiane near the riverfront, 4.4 km from Wattay International Airport, providing easy access to the city's most popular sights and attractions as well as numerous clubs ensuring a vibrant nightlife for visitors. 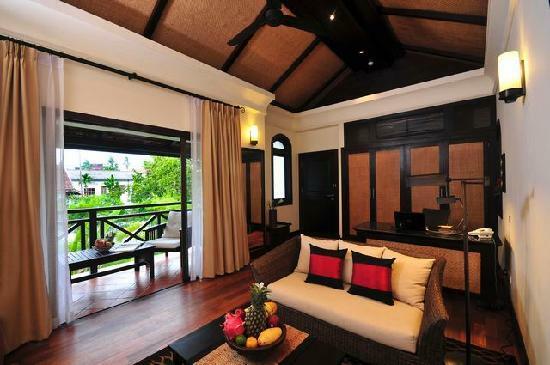 The hotel features a gentle blend of Lao traditional and Asian contemporary decor. The hotel's 14 rooms feature hand-woven silk headboards and cushions, wooden furnishings, rosewood parquet flooring, and striking black and white photographs of Lao's fascinating culture and sceneries. The Ansara Hotel is near such attractions as Khop Chai Deu, Joma Bakery Cafe, the National Cultural Hall, and Khop Chai Deu Restaurant. 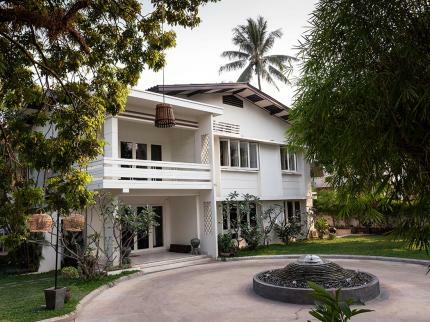 Designed to impress even the most discerning guests, this charming boutique hotel is centrally located in Vientiane near the riverfront, 4.3 km from the Wattay International Airport, placing visitors in the centre of the hustle and bustle of the city. Offering a wide selection of rooms, ranging from Superior to Salana Suite, all 42 guestrooms are tastefully designed to provide the utmost comfort to all guests, equipped with free LAN and wireless internet access, crisp white linens, a TV, stylish ensuite, and a balcony/terrace for many rooms. The Salana Boutique Hotel has a spa onsite with massage and hot tub available. Nearby popular attractions include Joma Bakery Cafe, National Cultural Hall, Khop Chai Deu, and Nam Phou Fountain. 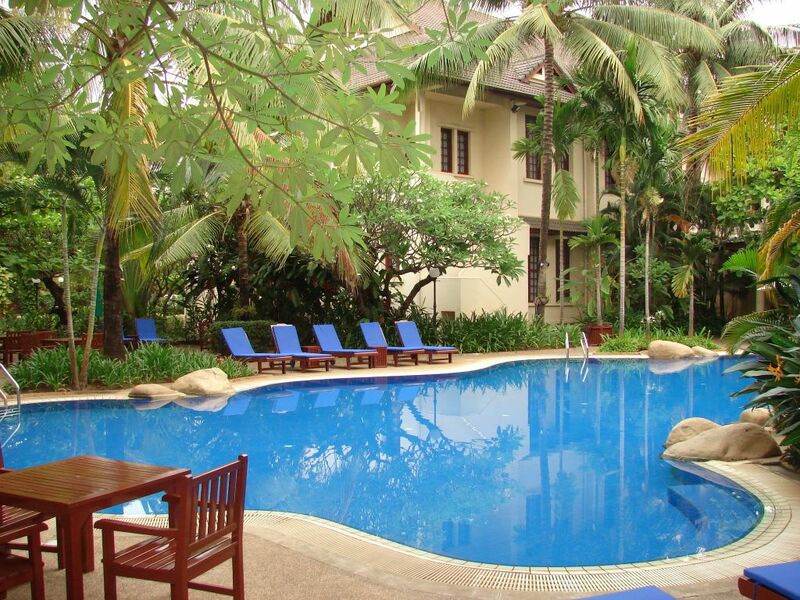 Salana Boutique Hotel in Vientiane! Well positioned in Vientiane city center, 5.2 km from Wattay International Airport, the Aroon Residence is the ideal point of departure for your excursions in Vientiane. The ambiance of Aroon Residence is reflected in every guestroom which are equipped with a balcony/terrace, fan, free wireless and LAN internet access, a TV, seating area, and bathtub. The Aroon Residence provides many amenities to enhance their guests' stay such as 24-hour room service, restaurant, airport transfer, bicycle rentals, tours, shuttle service, a smoking area, and laundry service. The popular attractions near the Aroon Residence include the Morning Market, Talad Sao Shopping Mall, and Patouxay. Designed for both business and leisure travelers, Mandela Boutique Hotel is ideally situated near the reiverfront, 1.5 km from the city center and 5.9 km from the Wattay International Airport, in one of the city's most popular locales. The hotel features 23 beautifully appointed guestrooms, each including a bathtub, air conditioning, complimentary bottled water, free wireless internet access, a coffee/tea maker, and in-room safe to make guest feel welcome and at-home. The Mandala Boutique Hotel provides a restaurant, bar, garden, bicycle rental, and tours to enhance their guests' experience. Popular attractions in this area of Vientiane include Ho PhaKeo, Haw Pha Kaeo, the Talad Sao Shopping Mall, and Wat Sisaket. 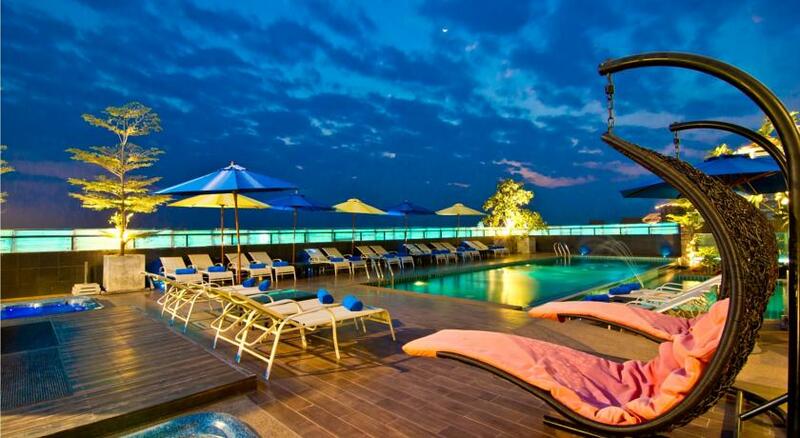 Mandala Boutique Hotel in Vientiane! 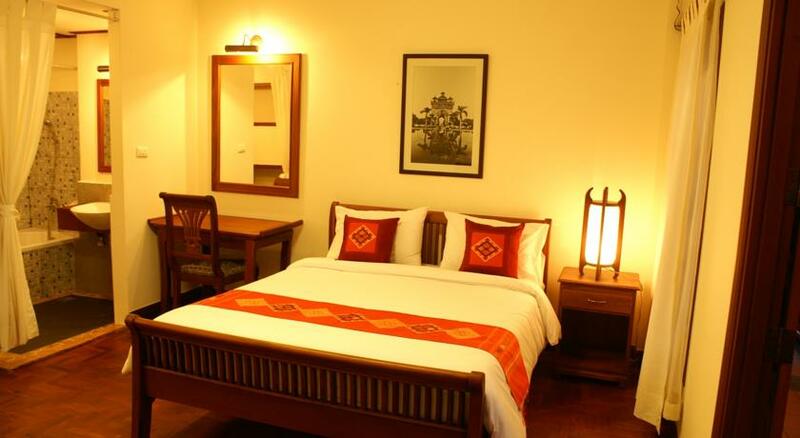 The Avilla Phasouk Hotel offers luxury and traditional Lao architecture near the Vientiane riverfront, 1km from the city center and 4.7 km from Wattay International Airport, in this 2012 Gold Circle Award winning hotel. Boasting 21 guest units, ranging from deluxe standard rooms to deluxe suites, each room is fully furnished with hardwood furniture, cable TV, mini bar and refrigerator, and bathrooms with hot water. Amenities of this hotel include a restaurant, massage, and a laundry service to ensure each guest's experience is memorable. Joma Bakery Cafe, Khop Chai Deu, Nam Phou Fountain, and Khop Chai Deu restaurant are just some of the popular attractions that are close to the Avilla Phasouk Hotel. Avilla Phasouk Hotel in Vientiane! Nestled in the very heart of Vientiane city center, and just 4.5 km from Wattay International Airport, the Manorom Boutique Hotel is an ideal spot from which to discover Vientiane. The ambiance of this hotel is reflected in each of the 45 guestroom, which are each equipped with air conditioning, free wireless internet access, a balcony/terrace, refrigerator, satellite/cable TV, and ensuite bathroom with shower. The Manorom Boutique Hotel has an elevator and wireless internet access in public areas for guest convenience. Popular attractions in this area of Vientiane include the National Cultural Hall, Joma Bakery Cafe, Wat Ong Teu Mahawihan, Lao National Museum, and Khop Chai Deu. 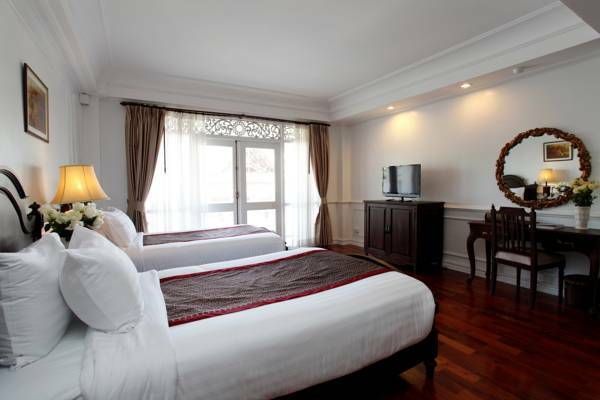 Manorom Boutique Hotel in Vientiane! Well known as the first modernist luxury hotel in Vientiane, Rashmi's Plaza Hotel Vientiane provides the ultimate comfort and convenience near Vientiane's riverfront, 7.1 km from the Wattay International Airport, and a hub to all cultural and tourist attractions. All 53 hotel accommodations have been carefully appointed to the highest degree of comfort and convenience, with bright and modern decor, free wireless internet access, a desk, TV, and stylish ensuites are just some of the thoughtful amenities provided. Ho PhaKeo, Haw Pha Kaeo, Presidential Palace, and the Talad Sao Shopping Mall are just some of the popular nearby attractions to the hotel. Rashmi s Plaza hotel Vientiane in Vientiane! Built in 1932 and restored to its former charm in 1999, the 5-star French colonial-style hotel is ideally located near the city's commercial district, 1 km from the city center and 4.9 km from Wattay International Airport. The 29 rooms feature beautiful Italian marble floors and crafted rosewood furniture, which combine to offer luxury and comfort, with crisp white lines, 4-poster beds, a seating area, and beautiful ensuite bathrooms. The top attractions close to The Settha Palace include Lao National Museum, the National Cultural Hall, Khop Chai Deu, and Joma Bakery Cafe. For travelers who want to experience the rich history of Vientiane and this historic landmark, Settha Palace is the ideal location. 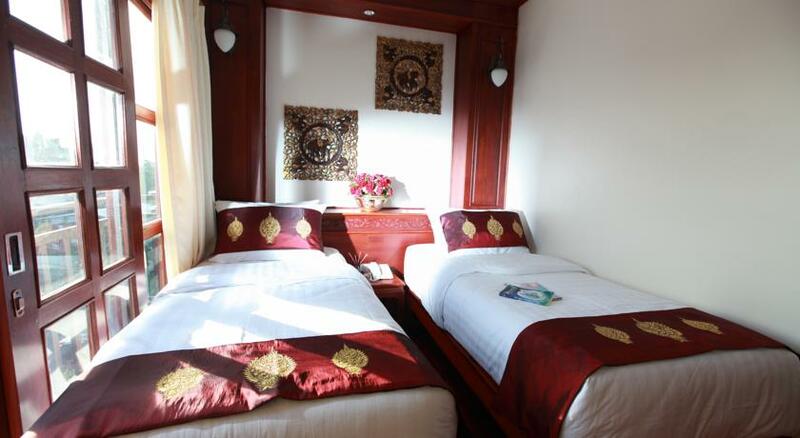 With just 2 suites in this Ban Nongping area hotel, the Deluxe Homestay - La Residence Mandalay has paid attention to every detail to ensure every guest's experience is relaxing and comfortable located 6 km from the city center and airport. Whether you choose the Art Deco or Colonial suite, each is equipped with air conditioning, a microwave, non-smoking rooms, a seating area, free wireless internet access, and beautiful ensuite. The Deluxe Homestay provides an outdoor pool, airport transfer, safety deposit boxes and a car park for guests' comfort and convenience. A short trip to town brings visitors to all the attractions this beautiful city of Vientiane has to offer. La Residence Mandalay in Vientiane!